The ReefKeeper Elite is true to its name, standing alone in the industry as the most innovative aquarium controller on the market. With the most intuitive interface and easy to use system controls, you’ll find it will simplify all aspects of your aquarium system that it controls. There’s also no need to find a power outlet near the head unit as there’s no power cord needed; power is provided right from the bus. The compact and convenient design, multiple mounting options and great looks makes the ReefKeeper Elite right for almost any installation; and without any unsightly probe wires dangling about, the head unit will add a touch of class to any tank! One of the biggest advantages of the RKE system is what it comes with! Other controllers leave you wanting and having to purchase add-ons just to get them to a usable level. The RKE system includes two PC4s; that’s 8 outlets to control! You also get an SL1 that will allow you to monitor pH, ORP, temperature and two switches; not to mention a free temperature probe and pH probe. All this for hundreds of dollars less than other controllers that barely give you enough to get started. Because the ReefKeeper Elite is a modular system we have the ability to develop new features as time goes on. One feature that we’ve been defining is an Ethernet module that will allow users to take advantage of their home networks and the World Wide Web. Digital Aquatics is dedicated to producing quality products at great prices! This module is still under development and we’re working on every aspect of it to reduce cost to you and NOT compromise safety and functionality. More to come on this optional module. A USB connection for your ReefKeeper Elite is needed for updates to firmware. However with additional hardware you can monitor your RKE with over 802.11, either within your home network or over the internet. We’ve worked hard to try and make the interface as simple and intuitive as possible for the RK Elite. With the advantage of the new interface we’re able to really produce a one of a kind experience. With 63 alarms and an audible and visual alert you’ll know when any of your critical system parameters are out of range. The multi-timer is all new. You’re now able to stack up to four unique timers to create any on/off cycles you would like. This is great for dosing and other scheduled tasks that don’t happen on a regular interval or for creating your own special cycle based on your needs. There are 63 advanced timers you can program and with the Multi-timer you can mix and match them in any fashion you’d like to get even more complex functions. The new “Controller” function can take any probe input and act on it with a user settable hysteresis. 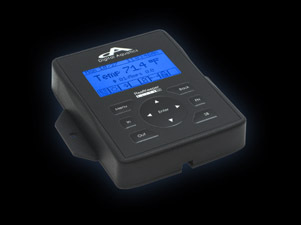 This includes pH, ORP, temperature and micro switches just for starters. You can also take action based on current draw or load on any PC4 and you’ll be able use any future probes that are added to the system! You can program the sump pump and skimmer pump functions to be off in standby and even have a standby delay just to make sure your system doesn’t overflow or over skim food after a feeding. We’ve expanded our old wavemaker control to include a “D” mode. Now you can set up multiple pairs of power heads to get all the turbulent flow you need! Lock out unwanted and accidental usage of your RK Elite. With a simple lock, you can make sure the kids, your friends or anyone else doesn’t mess with your controller. Wet fingers aren’t a problem with our full covering face plate.